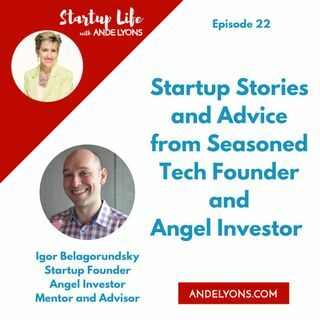 Our guest, seasoned Tech Startup Founder and Angel Investor Igor Belagorundsky, is all about startups. As his bio on Angel.co reads: Founder of startups. Developer for startups. Adviser for startups. Investor in startups. Excited about startups. I love it! I first met Igor at a local monthly startup pitch event called Startupalooza. He’s a judge for this event, and I had to dial up my smarty pants decoder ring to tap into his brilliant ability to quickly zoom in on a startup’s business model ... Más informaciones and ask relevant, highly valuable questions of the Founder(s). A technical, hands-on professional with over 20 years of experience in technology based businesses, Igor is a serial entrepreneur having most recently scaled Erecruit from a team of 3 to over 120, through several rounds of investments and to a successful sale for $62.8 million dollars. Woo Hoo! Active in the Boston startup scene as a founder, adviser, pitch competition judge and angel investor, Igor generously adds value everywhere he glows. He’s a confident full stack enterprise architect in several technology ecosystems, a trusted leader and mentor of professional services and R&D teams in multiple time zones and industries; he’s a big believer in smart and transparent teams, open communication across the entire organization, and leadership by example. He also just launched a new platform, FastCTO – a network of CTOs with decades of experience as actual CTOs and other C-level executives. And when he’s not sharing his genius with the world, Igor is an avid skier, a slow runner, a decent hiker and a doting dad. "Your value proposition doesn't matter because you're going to pivot a dozen times before you make money. Whatever you think your value proposition is, unless it's a very specific service-oriented business or something like that, it's going to change. Your revenue streams are going to change. Everything is going to change." "The obvious things investors look for in your deck is you have to prove that you have a well-defined problem that addresses a sufficiently large population, that your company and/or products can solve to some reasonable degree with a team that could prove that they can execute and grow the company and make money doing it in a reasonable amount of time which for an angel means three to five years max, with an exit strategy that can make investors money, where the funding you're asking for is the only thing that stands in the way." Igor provided us with a lot of information to think about – how will his advice help you and your startup? Please leave a comment or reach out on social media – your shared experience helps other founders grow and learn - thank you!